Australian couple Gail and David Wilson spoke out on Rúv national television last night detailing their ordeal when they got accidentally left behind on a snowcat trip to the wilderness below Langjökull glacier in South Iceland on Thursday. Over a hundred SAR team members searched for the couple and eventually found them safe and sound. Speaking to the news programme Wilson explains how the couple shared one snowcat, the last in a line of snowcats when a storm hit. All of them were supposed to follow, one after the other and the guide told them that if someone got left behind the guide would return to fetch them within ten minutes. The couple failed to start the engine on the snowcat and were therefore left behind although they waited for two and a half hours in the same spot for the guide. At this point they had become very cold and decided to bury themselves into the snow for warmth. "My wife was terrified, she thought we were going to die there, " says Wilson. Eventually SAR teams rescued the couple who are very grateful for their efforts. The Wilsons are furious at the company "They should be closed down. They sent us off on a trip when there had been a storm warning." See the interview with the couple (In English) on the link HERE. 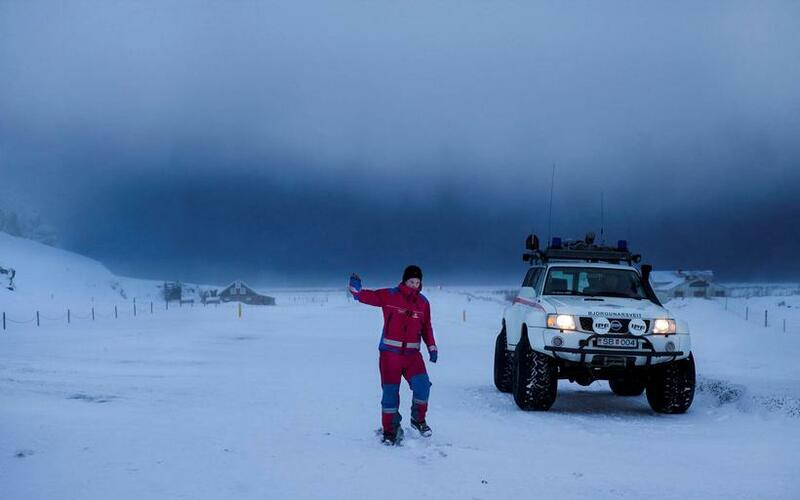 Director of Mountaineers of Iceland speaking to website Vísir.is said yesterday that the couple had not followed instructions, had moved from where they were located thus delaying SAR teams in finding them.